Jayme and John have an infectious positive energy. They can make you laugh by merely looking in your direction and want to help you in any way they can. I was fortunate to spend two months living on a farm and working alongside them. And now, they are helping me co-host the first-ever Midwest Vanlife Gathering May 18-20. As we gear up for this event, I thought it would be a great time to share their story and learn more how they are using their knowledge from living on the road to make a difference. John and I always been adventurers, but it took us a while to find a lifestyle that fit us best. Two years ago, we were living in a two-story, three-bedroom, 2,100-square-foot house. It was the two of us and our dogs Nymeria and Crow and we spent most days trying to convince ourselves how “successful” and “happy” we had become. John was hustling in the corporate world and was about to pursue his MBA, and I was juggling multiple jobs waitressing, working retail and babysitting. 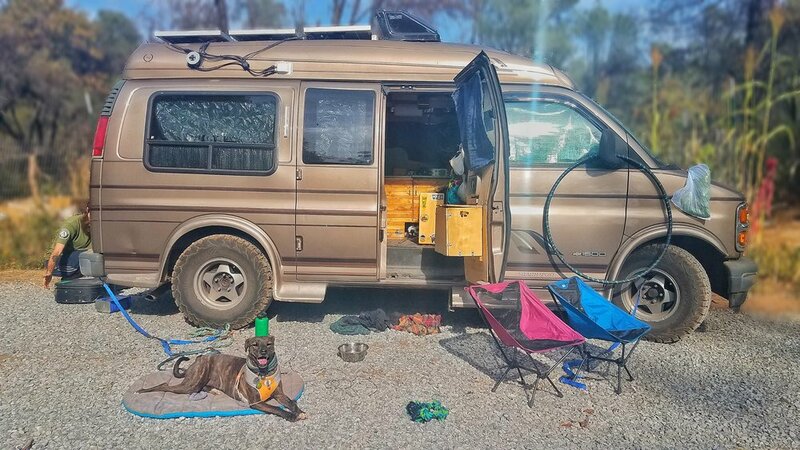 When we discovered vanlife, it was around the same time we were about to embark on a U.S. road trip or a “one last hurrah before we had kids” trip as we were calling it. We had sold all of our belongings, found renters for our house, and began building websites that now fund our travels. As we read more about vanlife, we knew that it was exactly what we were supposed to do. The freedom of going wherever we wanted and whenever we wanted, as well as not having to spend a fortune on where we were going to sleep each night, was beyond appetizing. Life on the road has been the most beautifully painted dream placed right into our hands. This does not mean everything is perfect though. We know that social media feeds into this idea that vanlife is some mystical heaven-like situation. And, personally for us, that’s exactly what it is. But there are just about as many lows as there are highs. We’ve blown a transmission line in the middle-of-nowhere South Dakota, we've pooped in holes that we've dug into the ground, we've been stuck in temperatures above 100 degrees, we've run out of water with none nearby to filter from and we've gotten agitated with one another without having another room to retreat to be alone. This community consists of a variety of people that understand our unique paths, and for the most part, everyone respects these paths with encouragement whether it looks like their own path or not. We knew that we wanted to help this incredible movement, which is why we started our blog. When we were selling everything, we discovered how little written information there was out there about building a van into a tiny home. 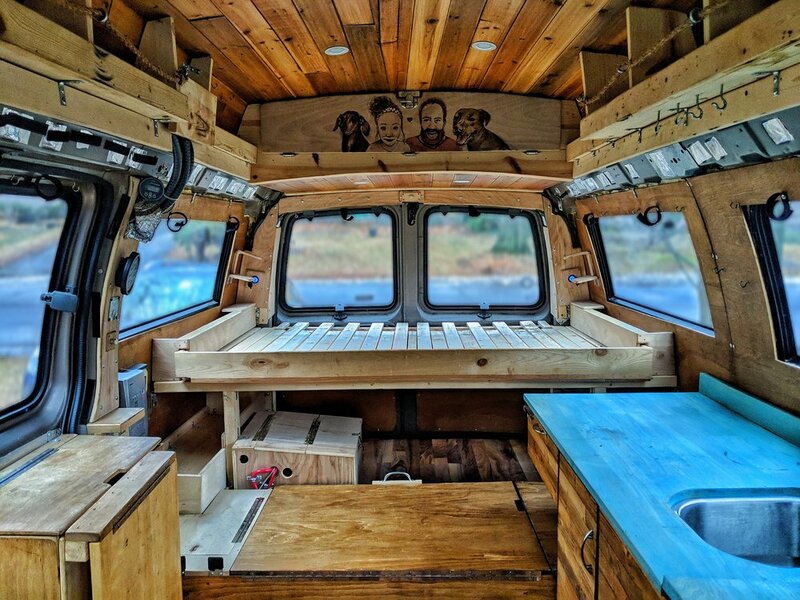 We found blog posts here and there, but they only covered one specific van build. And most of the information out there was several years old and not up to date. We wanted a place where people could ask questions like “What kind of refrigerator should we get?” and be able to find something that says, “Here’s your best options, and this option might be expensive but easier to use, and this option might be difficult, but cheaper/DIY." We weren't finding any of these options in our searches, which is why we decided to create our website. We started our website with information about what we were doing for our specific van build, but as we did more research and understood the needs of the community better, we quickly transitioned our website to contain more resources for building out a van. 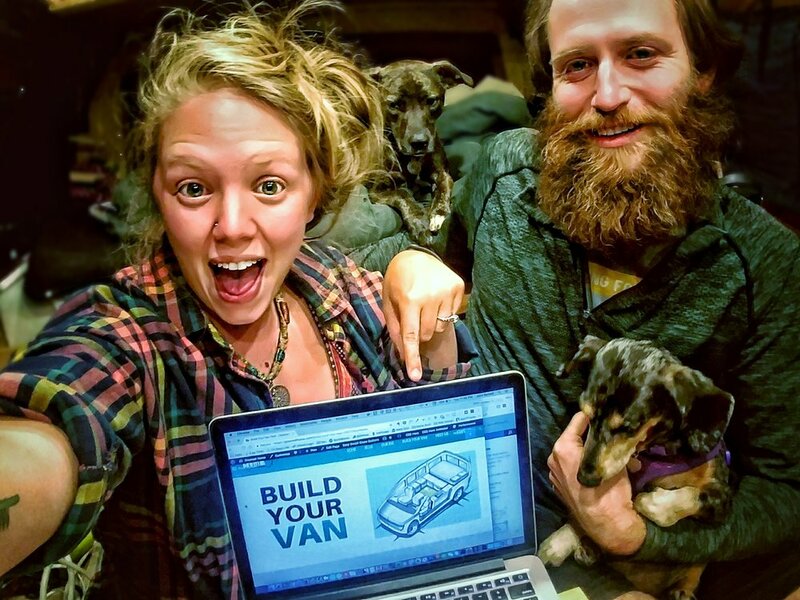 This ultimately influenced us to create a “Build Your Van” section of our website. This page is filled with more than 21,000 words on just about every subject you can think about when it comes to building out your van. Now we spend a lot of our time researching and writing informative posts on specific topics. We just launched a 7,000-word blog post all about 12-volt refrigeration options. Another way we love interacting with the vanlife community is through our United We Van effort. The idea behind this was to bring together this community of nomads and collectively give back to public lands—something we all take advantage of in some form or another. We are creating collaborations for the community and raising money for a nonprofit that every contributor gets to vote on. Last fall we launched the United We Van Cookbook, which is an e-book we created with more than 30 other vanlifers from all over the world. The cookbook is filled with more than 100 pages of delicious meals ranging from breakfast scrambles to tacos to pastas to hummus to smoothies and to even more tacos, and so much more. The contributors voted to donate 100% of the proceeds to The Nature Conservancy, and as a community we helped raised more than $1,300. We are now about to host the first ever Midwest Vanlife Gathering with Vanlife DIaries in Missouri May 18-20! Ticket and raffle sales will be donated to Adventure Works, an Illinois based nonprofit that works with troubled teens and families through wilderness therapy. 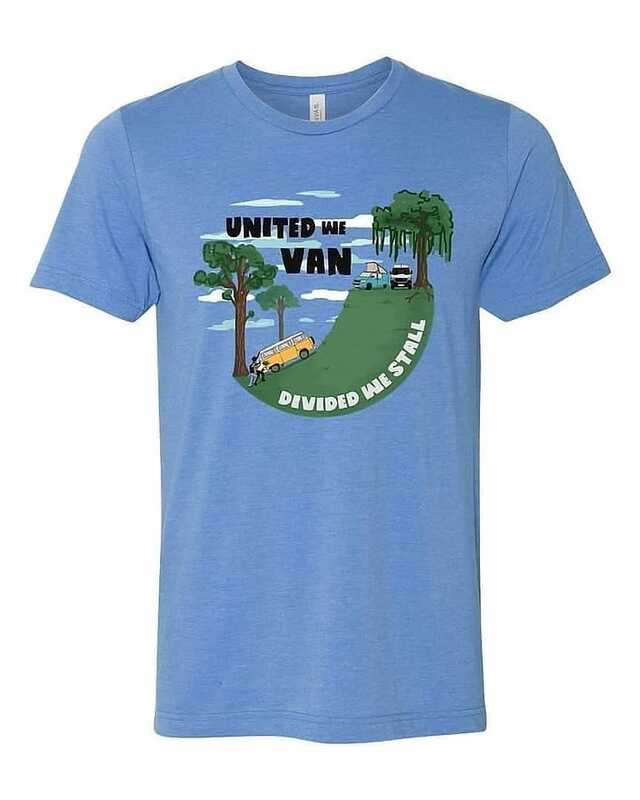 We are also selling our “United We Van/Divided We Stall” t-shirts and will be donating 100% of the proceeds to Adventure Works as well. Even though we have already hit our one-year anniversary of being on the road, we still feel like our adventure is just beginning. There’s still so much we haven’t seen and even more things out there we want to do. Photos courtesy of Jayme & John Serbell.